The City of Warner Robins gas pipelines are installed within a strips of land called 'easements' which are varied in width. This allows the city to access the pipelines for observation, maintenance and installation of new gas services. Because natural gas pipelines are built underground, line markers are used to indicate the approximate location of the pipelines. Pipeline markers are not intended to identify the exact location of a pipeline. Markers are only intended to provide a warning that an underground pipeline is located nearby. Pipeline markers do not indicate the depth of the pipeline. Pipeline markers do not indicate how many pipes are installed underground. Pipeline markers do not indicate bends or other direction changes on a pipeline. 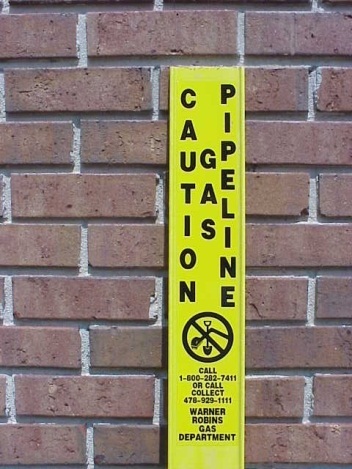 Never assume that pipelines are installed in a straight line. No building or tree planting is allowed within the gas pipeline easement. Pipeline easements must be kept free from any structures, trees or other obstructions. If you are planning to do any work near a gas pipeline easement, you must first call the Georgia One Call Center by dialing 8-1-1 or 800-282-7411 at least two days prior to the work.